Rather than apologizing for quoting so much from C.S. Lewis over the past few months I decided to recommend a set of his books (some of which I have reviewed). This last year I decided to read a whole set (plus a biography) and have not at all regretted the project. As a matter of fact, I found myself hurrying through more contemporary books in order to get back to Lewis. Bertrand Russell said, ‘‘Most Christians would rather die than think–in fact they do.’’ At least Lewis made me a little more prepared to die. These six come in a pack sold by MacMillan Company. 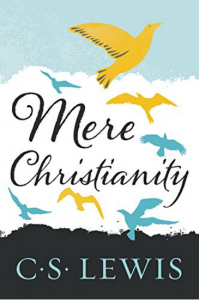 Mere Christianity is probably Lewis’ most famous work. It is the prototype of modern apologetics. He argues not for ‘‘Christianity And . . . but for Mere Christianity.’’ The Screwtape Letters is also well known. It is the original demon book. Screwtape, the experienced demon writes to Wormwood, his inexperienced nephew about the destruction of a Christian. The Problem of Pain is a treatise on why Christians suffer. Lewis lived with physical pain most of his life. Miracles may be the best on that subject in this century. It was the most intense but offered a perspective desperately needed in the healing section of the book store. The Great Divorce was a fantastic bus ride from hell to heaven (reviewed last month). Finally, The Abolition of Man is a book that should be read by any progressive thinker trying to blend Christian ethics with current culture. The first chapter, “Men Without Chests,” describes to 90’s man better than any contemporary author.